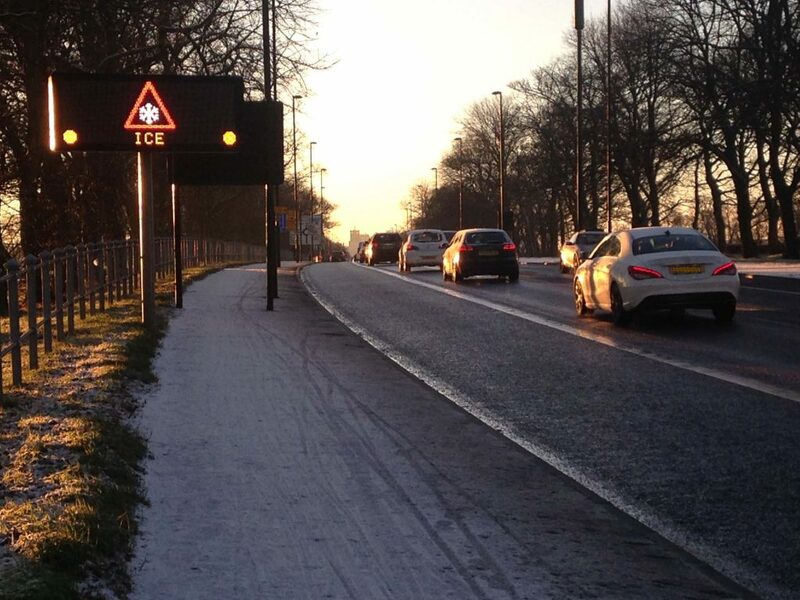 In January 2018, SPACE for Gosforth, together with SPACE for Heaton and SPACE for Jesmond wrote to Newcastle City Council to express our concern that no cycle ways and few pavements are cleared of ice in winter, despite it being the Council’s own policy to encourage people to walk and cycle more often. UK Roads Liaison Group best practice for local authorities suggests that snow and ice clearing approaches should be developed with local stakeholders and so we asked that this be discussed as part of the Cycle Stakeholder Forum on Thursday 25 January 2018. 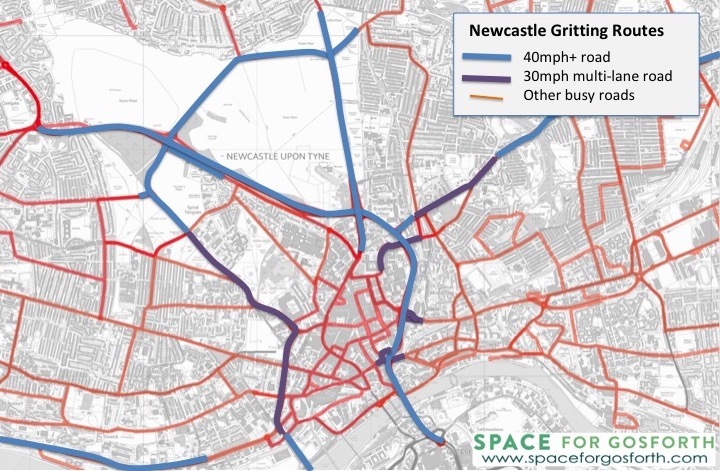 We also shared the following map that shows that if you were to try to cycle using the currently gritted network you would have to use either 40mph+ or multi-lane roads to enter the city from the north, east or south. The Council does have a winter service plan that covers current operation including some pavements but not cycle lanes. The Council will do a review after March of the service plan and will consider the points raised in our letter as part of that review. The output from that review will be brought back to the Cycle Stakeholder forum for further discussion and action. Details for the Newcastle Cycle Stakeholder Forum can be found on the Newcastle City Council website. This is the letter that we sent to the Council. Re: De-icing pavements and cycle routes in winter. We are writing as we are concerned by the Council’s current stance that no cycle ways and few pavements are cleared of ice in winter and that this is leading to a number of negative consequences, not least the potential and actual injury of people cycling or walking. Clearly under current policy, safe passage for people walking or cycling is endangered, and many might consider advice for people cycling to stick to the gritted network to be unacceptable given the only gritted routes into the city are dual carriageway and often with speeds that mean any collision would lead to serious injury or death. It is also easy to determine that it would be reasonably practicable to de-ice the City’s main cycle routes and pavements both from the fact that a number of other local authorities do so and from the legal definition of ‘reasonably practicable’ that requires that risks must be averted unless there is a gross disproportion between the costs and benefits of doing so (4). In this case the benefits are obvious in reducing harm, in supporting Council strategy to promoting sustainable transport choices (Policy CS13); in meeting national air quality targets; and in maintaining access to the city for people who wish to, or have no choice but to, walk or cycle. If the Council is serious in its wish to support the growth of active travel to improve the health, environment and economy of the City and its residents, then this is an issue that needs to be addressed. The question is not if but when, and planning for this should start immediately. We are grateful that the Council has already taken up our request to publicise the lack of ice clearance so that people wishing to cycle are aware of the potential dangers. In addition we ask that the Council prepares a target Winter Service Policy for walking and cycling networks with stakeholders (as suggested in the UK Roads Liaison Group best practice) including the Cycle Stakeholder Forum. This should include routes to be cleared, effective approaches for how they are to be cleared and also consideration of funding, though work on the former should not be delayed while funding is sought. To support this work we have included below links to Highway Authorities in London, Manchester, Bristol, Edinburgh, Glasgow, Nottingham and Cambridgeshire, all of which have plans for clearing snow and ice from their cycling networks. I would be grateful if you could include this on the agenda for the next Cycle Stakeholder Forum along with a draft plan from the Council for how it will develop the Winter Service Policy. SPACE for Gosforth, SPACE for Heaton, SPACE for Jesmond. Nottingham’s Winter Service Plan sets out priorities and response times for treating cycle ways. The revised Winter Service Policy is to be presented to Council Cabinet on Monday 19 November. Details can be found on the Council’s website. The updated policy (item 6 on the agenda) includes statements on both walking and cycling. Certain walking routes will be treated if frost or ice is expected to last more than 48 hours, or if snow is expected to remain for more than 24 hours. Most of the walking routes to be treated are in the city centre but they also include Gosforth High Street, Ashburton Road, Kenton Park shops, Park Avenue shops, Brunton Park shops, Melton Park shops and Wansbeck Road shops. Cycling routes will not be treated except where they are on a road that will be gritted e.g. a shared bus and cycle lane, or where they share a pavement with one of the named footpaths. This does not exactly align to Section 41 of the Highways Act 1980 that says that Highway Authorities must “ensure, so far as is reasonably practicable, that safe passage along a highway is not endangered by snow or ice.” We would welcome any input from any legal professionals to assist in clarifying the extent of the Council’s legal responsibilities. This entry was posted in Cycling, Safety, Walking and tagged children, cycling, pavements, Town Moor, walking on February 6, 2018 by SPACE for Gosforth. It is important to clear the cycle ways of ice. Hopefully the council will listen to recommendations and make it safer for cyclists!